Christopher Rhodovi planned to join the military, but God had other plans. In 1996, one month before fulfilling his lifelong dream of joining the U.S. Army, Rhodovi received his one-and-only college acceptance letter from The Peabody Institute of The Johns Hopkins University in Baltimore. Rhodovi, a 2001 graduate of Peabody, has performed in operas in Baltimore, Annapolis and Washington, D.C. for the past 12 years. 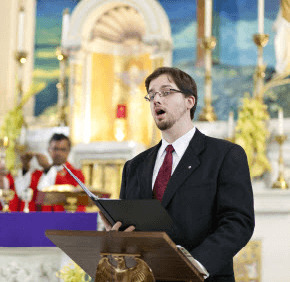 The Mount Vernon baritone has also been a cantor at nearly a dozen parishes in the archdiocese since 2001. Rhodovi is currently a cantor and bass section leader at Immaculate Conception, Towson; a substitute cantor at the Basilica of the National Shrine of the Assumption of the Blessed Virgin Mary in Baltimore; and a parishioner, cantor and music director at St. Leo, Little Italy. Rhodovi’s wife, Karen Myers Rhodovi, is also an opera singer and a cantor at St. Leo. Whether singing in church or on stage, Rhodovi relies on his training. Rhodovi, who began singing as a child and was in chorus during high school, said being a cantor has “helped my faith grow” and allowed him to comfort people, particularly when singing at funerals. Cantoring also helps to preserve opera, Rhodovi said. 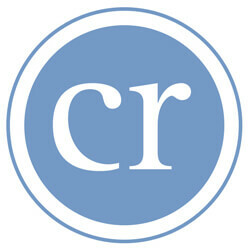 “For whatever reason, opera has a difficult time attracting a younger audience,” Rhodovi said. To support himself, Rhodovi has worked as a paralegal, waiter, barista and realtor. Since 2009 he has worked in admissions at Notre Dame of Maryland University in Baltimore, where he is pursuing a graduate degree in the nonprofit industry. Rhodovi hopes performing can one day be his only occupation. Rhodovi approaches his job as a cantor “as an extension to being a parishioner,” Bitner said. “As a cantor, you are also in a position of leadership for the congregation,” Bitner said. “The way to accept it is to return it to God (and) to his people,” Father Furnari said.